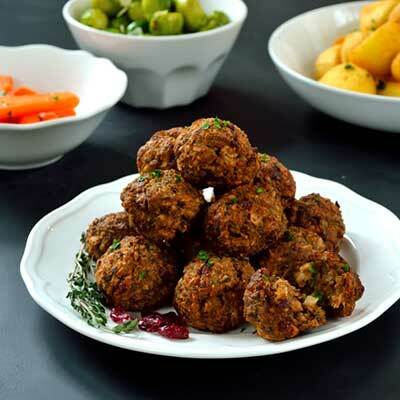 Full of festive flavours with a heavenly crunchy texture, these vegetarian stuffing balls are the perfect trimming for Christmas dinner. Boil the parsnips for 7-9 minutes until tender, then drain off the water, return to the pan and mash until smooth. Set aside to cool. Combine all the remaining ingredients in a large bowl, then add the mashed parsnip and mix thoroughly. Season with salt and pepper. Take a heaped tablespoon of the mixture, roll into a ball (roughly the size of a golf ball), and place on an oiled baking tray. Repeat until all the mixture has been used up. Spray or brush the balls with a little oil. Bake the stuffing balls for 15 minutes or until golden brown.